Let’s suppose the presidential election turns out to be close. How could it play out? The Crystal Ball team analyzed the Electoral College map and plotted out some different scenarios, which we describe and illustrate below. Scenario One: The Fickle Five Defect. Obama’s five closest victories in 2008 came in states George W. Bush carried twice: North Carolina, Indiana, Florida, Ohio and Virginia, which he won by margins ranging from 0.3% (NC) to 6.3% (VA). Obama is currently thought to be trailing in these “fickle five” — yet he could lose them all in 2012, plus the extra electoral vote he gained from Nebraska (which is assumed in all scenarios), and still win with 272 electoral votes. Scenario Two: Obama as Gore, Plus a Little. It’s back to the future, as Obama sheds his 2008 Western and Southern gains (CO, IA, NV, NM, NC, VA) but captures all the core Democratic states in the Northeast (though not NH), Midwest and West Coast, precisely as Al Gore did in 2000. He loses the Gore states of New Mexico and Iowa, but he finds the extra 537 +1 votes in Florida that eluded Gore. Obama triumphs with 271. Scenario Three: Kerry Plus Ohio and Iowa. Obama misses in Florida, loses his newfound 2008 gains in the South and the West, but adds just two Midwestern states (OH, IA) to the map won by John Kerry in 2004. 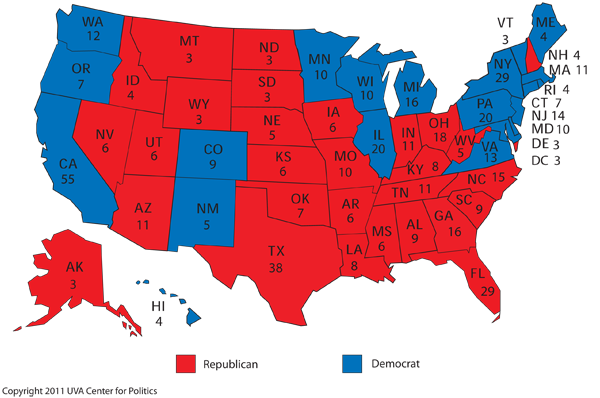 Obama’s Electoral College total: 270. Scenario One: Turn the Fickle Five Red Plus Any Other State. To win, the GOP nominee probably has to capture six 2008 Obama states. 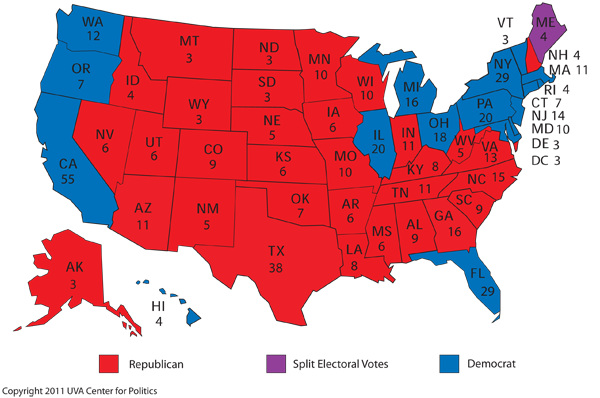 Unless Republicans can flip a big, usually Democratic state such as Pennsylvania, Michigan or New Jersey, they’d have to switch the Fickle Five plus one other small or medium-sized Obama state, such as New Hampshire or Iowa (in the scenario illustrated below, NH goes Red, putting the GOP at exactly 270 votes). Scenario Two: Mix & Match, West and South. Republicans can retrieve Indiana and North Carolina (the most likely two of the Fickle Five to return home) plus the three previously GOP Western states they lost in 2008 (CO, NM, NV), and add a hodgepodge of others (IA, NH, WI, VA and the electoral vote from Maine’s more conservative Second Congressional District) plus one modest shocker — Minnesota — that is home to GOP presidential candidate Michele Bachmann. Republican total: 270. The Tie Scenario: You knew this was coming. We always talk about it though the chances are minuscule. If Obama loses IN, OH, NC, NH, NV, FL and IA, while keeping Virginia and his other 2008 states, it is 269-269, and the House of Representatives picks the new president, with each state’s delegation having one vote and 26 votes needed for election. In today’s House, the Republican would win by a vote of 33 to 16. One state, Minnesota, has a tied delegation and presumably would not cast a vote. Kyle Kondik, Tim Robinson and Isaac Wood contributed to this article.